And now I'm starting to wonder if this photo -- which I'm currently liking (stress on 'currently') -- works better in black and white. I posted the color version the other day. It wasn't an easy conversion to B&W. I wanted to maintain as much contrast as possible while also lightening up the trees to make them distinguishable from the mountain. More dramatic clouds would also help the black and white version. My own three cents is that both versions work for different purposes. The color image shows off the beautiful light and contrasting colors of the Sierra -- the red of the mountain, the blue of the sky, the green of the trees. 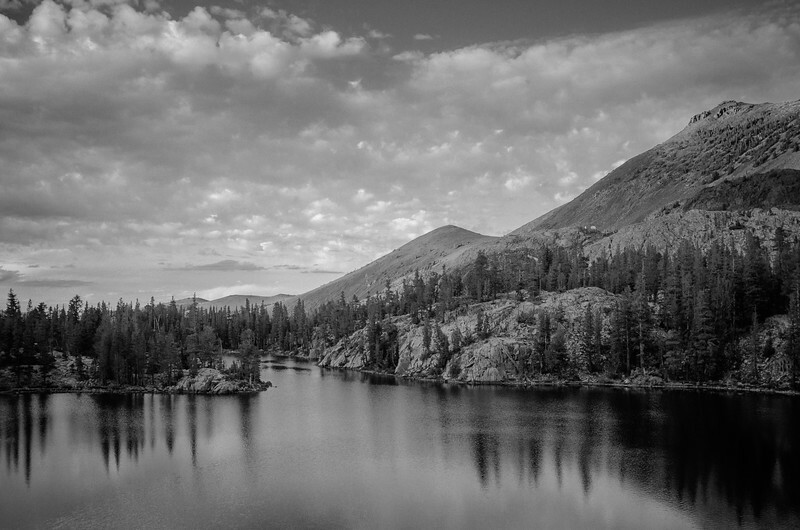 The black and white, on the other hand, tends to emphasize the composition and may remind the viewer of the rich history of photographing the Sierra in black and white. Love the above photo? Buy a print! My prints are through SmugMug (very good quality) and are priced very modestly.